I hate “classical music”…The phrase is a masterpiece of negative publicity, a tour de force of anti-hype. I wish there were another name. I read those words on a screen hanging above a stage set for five chamber musicians at last week’s Fringe concert. I blogged about this group last month and I was eagerly anticipating attending a performance for the first time. I was very, very curious about how the whole event would shake out. 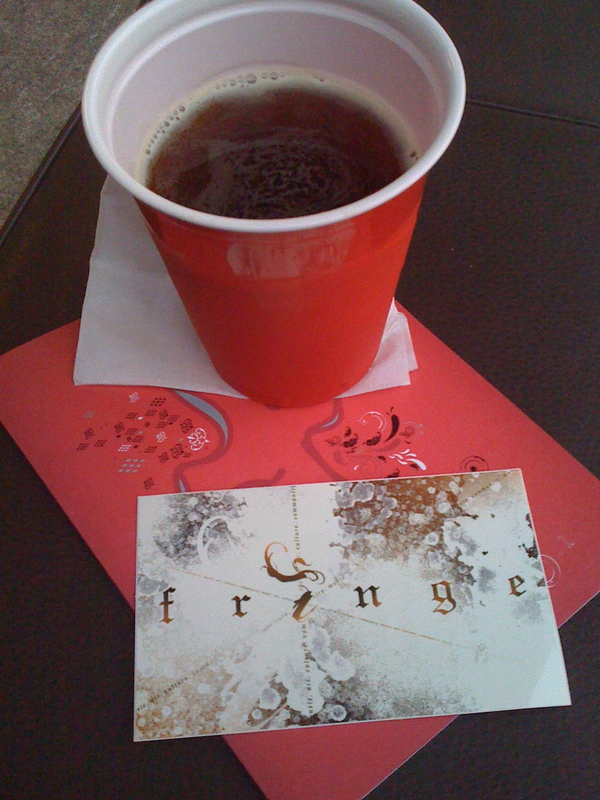 Fringe does more than put on a concert of nice-sounding music. ‘Concert’ isn’t the right word for what they do – a night with Fringe is a multi-media, multi-art event. In one night, they stage an art gallery, an open-air club, a short film screening, a music appreciation course and chamber music performance. The whole thing works and it’s wonderful. 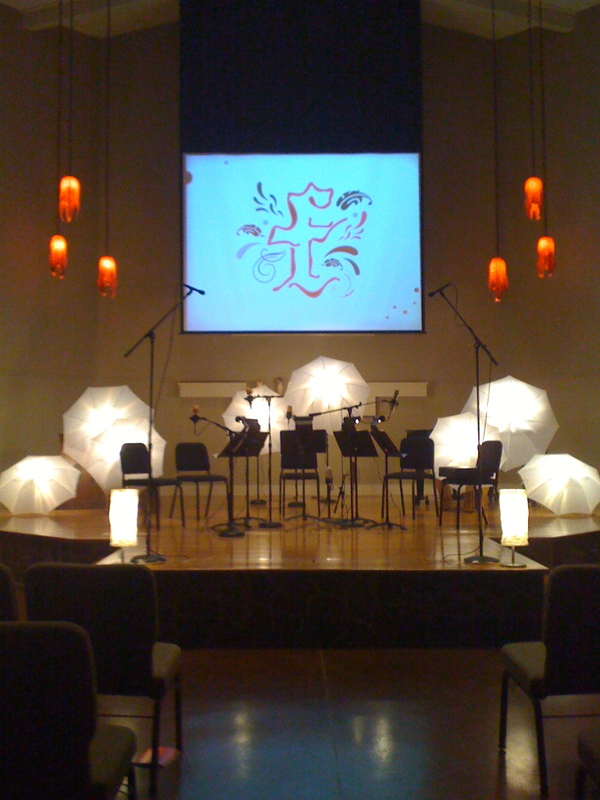 When the time for the ‘concert’ arrived, I joined the other patrons in the sanctuary. The screen above the stage lit up with a pleasant short film about a young, preening rock star who has to spend an evening in a pediatric hospital while on tour (Pop Star, by Nathan Scoggins). The screen went black again, but prior to the live music, a documentary was played – a professionally crafted video with interviews of the musicians we were about to see take the stage. One by one, the members of the quintet spoke about the piece we were about to hear them play, about their own role in it, about the particular challenges or joys of the work itself. It was brilliant. We learned that the clarinet quintet they would be playing was composed by Mozart for a drinking buddy, and that the buddy must have had a pretty good hand, since at that point in history the clarinet hadn’t developed into that great-sounding of an instrument. So, after the photos in the lobby, after the night air and the film and the insights into the music of the evening, then the musicians took their places. And what a difference it made to hear a piece after being given so much information about the music and about the players! I can only speak for myself, but I know that my watching, my listening was enhanced tenfold when I was given those glimpses behind the curtain. Another great joy of the night – a Fringe audience is not afraid to applaud between movements of a piece. I enthusiastically joined in, knowing that a big, fancy ‘classical music’ rule was being broken. After an intermission, the film that opened the second half of the concert was Western Spaghetti (PES Films). In the second musician documentary, the violinists mentioned that the Brahms quintet on the program was composed with a lot of doubling between their two instruments, and playing with correct intonation could pose a challenge. I never noticed a wrong beat, but just being able to listen for those moments in the music and have some idea of what the players were working towards made me feel closer to the them and to the piece. 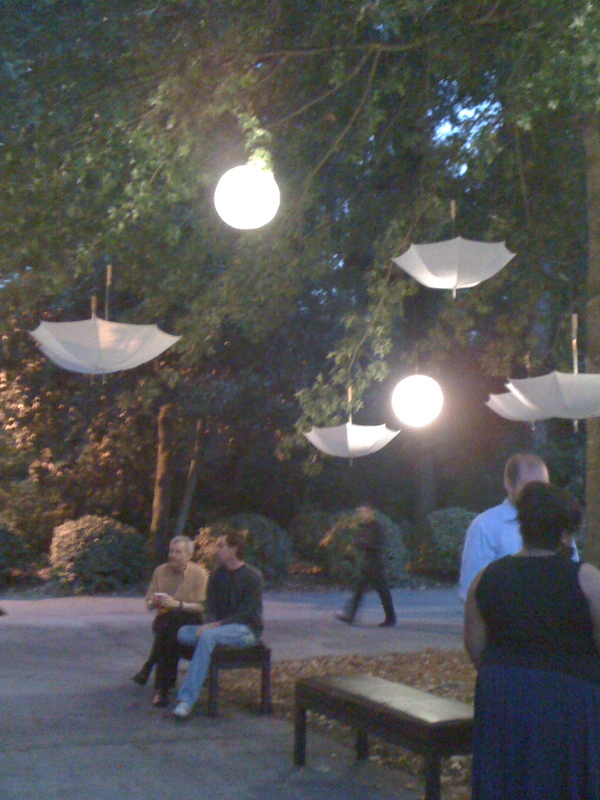 When the music was finished and the stage was being broken down, I returned to the courtyard and found the quintet happily downing post-performance beers. These are my kind of people. I’m afraid I gushed at them a bit, telling them, ‘I wish all of my recitals could look just like this!’ But I do. This group has found a unique way to foster more intimacy, more connection with audiences – they know that the closer we can feel to each other, the better the music experience is. There is a better name for ‘classical music’ – at least here in Atlanta. It’s called Fringe.